Don't despair TheVetteNet.com can find you another one. Simply contact us today to let us know you like this car. Thanks for stopping by to view this nice yellow/black 1972 Corvette convertible offered to you by THE VETTE NET. We are a professional Corvette brokerage network and a proud Lifetime Business Member of the National Corvette Museum. 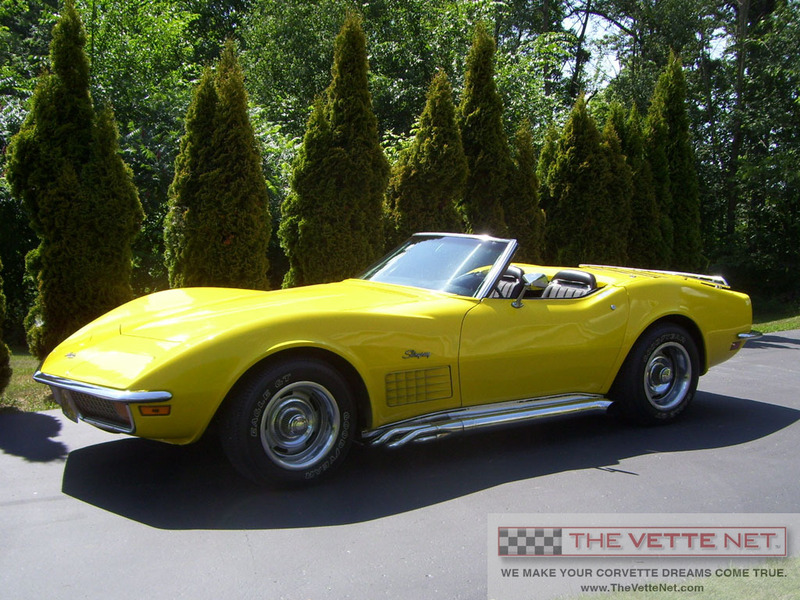 If you have your sights set on owning a yellow Corvette, here is one that you must see. We suggest you put on your sunglasses first. This yellow Corvette is brilliantly nice! The owner of this Corvette has kept it in top condition. She and her husband have been the caretakers since 1985. Yes, there are some paint chips and some low luster chrome but the �72 Stingray still looks good and gets lots of compliments. The interior has been refreshed and is in very nice condition. You will see that in the photos. The soft top is also nice. Under the hood is a performance-built 350 cu.in. Corvette engine rated at 325 horsepower by its builder, Booth Aarons. They are a very well respected performance engine builder located in Michigan. The engine delivers great performance when you want it and is mild mannered when just cruising around town. Of course, those chrome side exhausts deliver the sound that makes people take notice. Transmitting the power and torque to the Positraction rear end is a 400 Turbo-Hydramatic transmission. It has been rebuilt with a mild stall converter with shift kit added. That transmission shifts with authority when prompted to do so, yet it shifts softly when you�re just cruising around. It�s a great feature to have in your Corvette. Speaking of features �this Corvette has power steering, Positraction, Turbo-hydramatic transmission, AM/FM aftermarket radio, auxiliary hardtop, Soft Ray tinted windshield and Rally wheels. More importantly, this is a convertible and you know how much more fun they are. In business since 1998, THE VETTE NET (on the Net at www.TheVetteNet.com) has established itself as the premier source for buying, selling and leasing Corvettes, with over 2,500 enthusiasts assisted nationwide and international. We are fellow Corvette Club members. We drive Vettes. We live the life-style, and enjoy the hobby. Our motto is under commit and over deliver and we guarantee a pleasant and straightforward experience. If yes, you may want to take advantage of our FREE and unique marketing program. There is no upfront fee and no exclusivity. CLICK HERE to submit your Corvette for sale using our highly regarded Corvette broker service. Thank you.